To compare optical coherence tomography angiography (OCTA) images from three different devices. This was a prospective, observational, cross-sectional study. All eyes (n = 24) were imaged thrice each time with swept-source OCT (DRI OCT Triton Plus; Topcon, Tokyo, Japan), spectral-domain OCTA (AngioVue; Optovue, Fremont, CA), and SD-OCT Angioplex (Cirrus HD-OCT 5000; Carl Zeiss Meditec, Jena, Germany). Outcome measures were foveal avascular zone (FAZ) area, vessel density, spacing between large vessels (SLV), and spacing between small vessels (SSV). They were calculated using local fractal analyses and Frangi filter. The vascular parameters showed good to excellent repeatability (intraclass coefficient > 0.8) in the three devices. The FAZ area (P = .3) and vessel density of the superficial layer (P = .8) were similar between the devices. In the deep layer, vessel density was significantly higher (P = .02) with Angio-Vue images compared to those acquired using the other devices. However, SLV was significantly higher (P < .05) and SSV was significantly lower (P < .05) on Angioplex scans compared to other devices. Vessel parameters were significantly altered in Frangi-filtered images as compared to nonfiltered images. Vessel density showed good repeatability among the three devices, although there were differences in vessel parameters between the devices. Also, vessel parameters changed significantly after Frangi filtering. Optical coherence tomography angiography (OCTA) is a noninvasive and dyeless imaging technique for the evaluation of retinal microvasculature.1 OCTA is a useful modality for evaluation of diseases (eg, diabetic retinopathy,2 retinal artery and vein occlusion,3 choroidal neovascularization,4 and glaucoma.5) Studies comparing OCTA with fundus fluorescein angiography (FFA) and indocyanine green angiography (ICGA) have shown comparable results.6–8 Currently, several OCTA devices are available for clinical use. 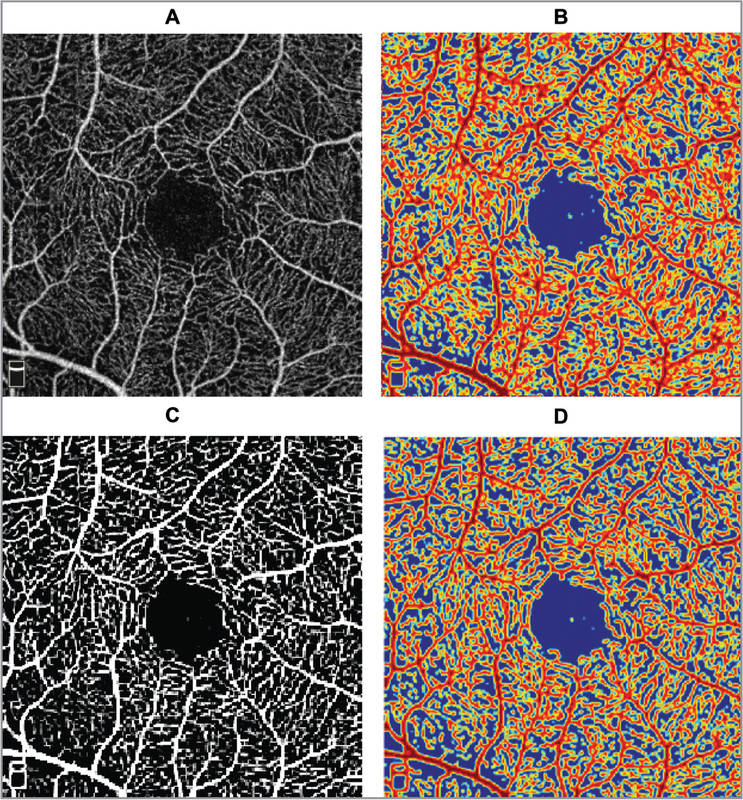 However, direct comparison of the OCTA images is difficult since each device uses a proprietary algorithm to quantify vascular parameters.1–8 In this study, three such OCTA devices were compared using the local fractal dimension (LFD) method.2,5,9,10 Further, the retinal vessels in the OCTA images were enhanced using a multiscale Frangi filter11 to study the effect of enhancement and noise suppression on the OCTA images and resulting vascular parameters. 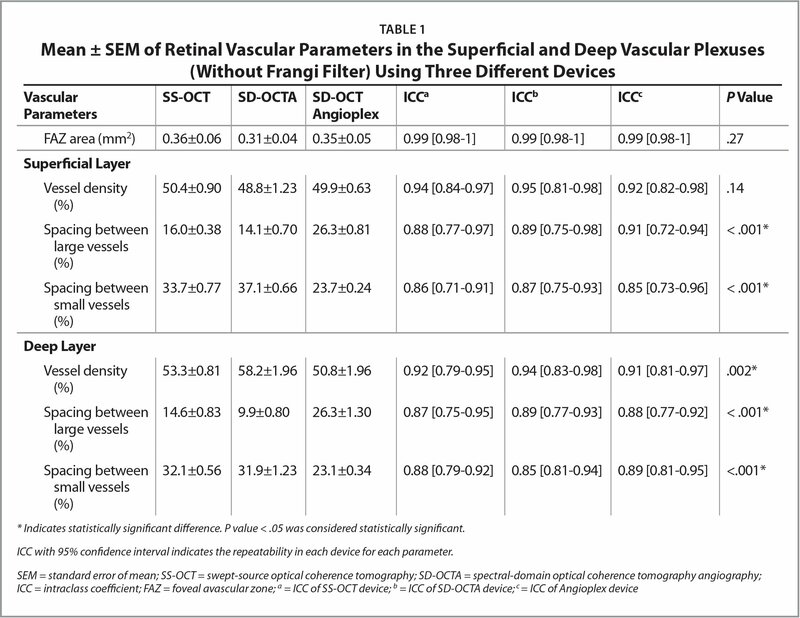 In this study, the analyzed vascular features were foveal avascular zone (FAZ), vessel density, spacing between large vessels (SLV), and spacing between small vessels (SSV).2,5,9 Also, repeatability of each OCTA device was assessed by measuring each eye three times with each device. This was a prospective, observational, and cross-sectional study approved by the institutional ethics committee of the Narayana Nethralaya Eye Hospital in Bangalore, India. Written informed consent was obtained from all subjects. The study adhered to the tenets of the Declaration of Helsinki for research involving human subjects. Twenty-four eyes of 24 healthy Asian-Indian subjects (age range: 22 years to 27 years) were included in the study. Subjects after comprehensive ocular examination (distant visual acuity of 6/6, N6 vision, and refractive range from −1 to +1 diopters, no prior ocular surgery, no ocular inflammation) were included in the study. All subjects were imaged with swept-source OCT (SS-OCT) (DRI OCT Triton Plus; Topcon, Tokyo, Japan; 100,000 A-scans/sec, 1,050 nm), spectral-domain OCTA (SD-OCTA) (AngioVue; Optovue, Fremont, CA; 70,000 A-scans/sec, 840 nm), and SD-OCT Angioplex (Cirrus HD-OCT Model 5000; Carl Zeiss Meditec, Jena, Germany; 68,000 A-scans/sec, 840 nm). SS-OCT, SD-OCTA, and Angioplex images had a resolution of 320 × 320 pixels, 304 × 304 pixels, and 245 × 245 pixels, respectively. Each eye was imaged three times with each device. The scanned area was 3 mm × 3 mm on each device. Analyses were performed on the OCTA images generated from the superficial and deep retinal vascular plexuses. 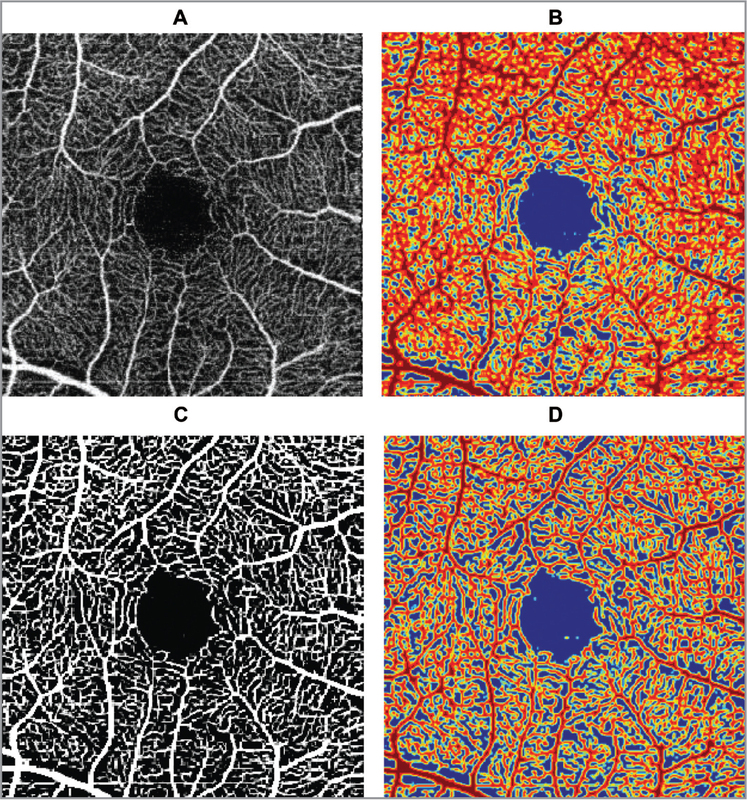 OCTA images of the superficial and deep retinal vascular plexus had a dense vessel network. Vessel enhancement filtering was performed on the OCTA images using a well-known multiscale approach known as the Frangi filter.11 This method used Eigen values of the Hessian to determine presence or absence of the vessels and provided an excellent noise and background suppression to enhance the vessels.11 To quantify the vessel density in the OCTA images, LFD method was used.2,5,9,10 This method was applied to both the non-filtered and the Frangi-filtered OCTA images. A normalized LFD ratio was computed for each pixel of an OCTA image.2,5,9 Similar to our previous studies, a two-dimentional contour map was generated and vascular parameters (area of the foveal avascular zone [FAZ], vessel density, spacing between large vessels, and spacing between small vessels) were computed.2,5,9 These parameters played a distinct role in evaluating the grade of the disease and the changes that occurred in the retina with progressive worsening of the disease (eg, in diabetic retinopathy, vessel density decreased with grade of severity). All analyzed variables were reported as mean ± standard error of mean (SEM) after confirming normality of distribution using Kolmogorov-Smirnov test. The analyzed variables were area of foveal avascular zone (FAZ in mm2), vessel density (%), SLV (%), and SSV (%). The repeatability of a vascular parameter on a single device (SS-OCT, SD-OCTA, and Angioplex) was assessed using intraclass correlation coefficient (ICC). From three repeat measurements, a mean value of a vascular parameter was calculated for each eye. Then, repeated measures analysis of variance (r-ANOVA) was performed to compare the mean vascular parameter of each eye between the three devices. These analyses were performed before and after vessel enhancement with the Frangi filter. A P value less than .05 was considered statistically significant. All statistical analyses were performed in MedCalc Statistical Software version 17.6 (MedCalc, Ostend, Belgium). 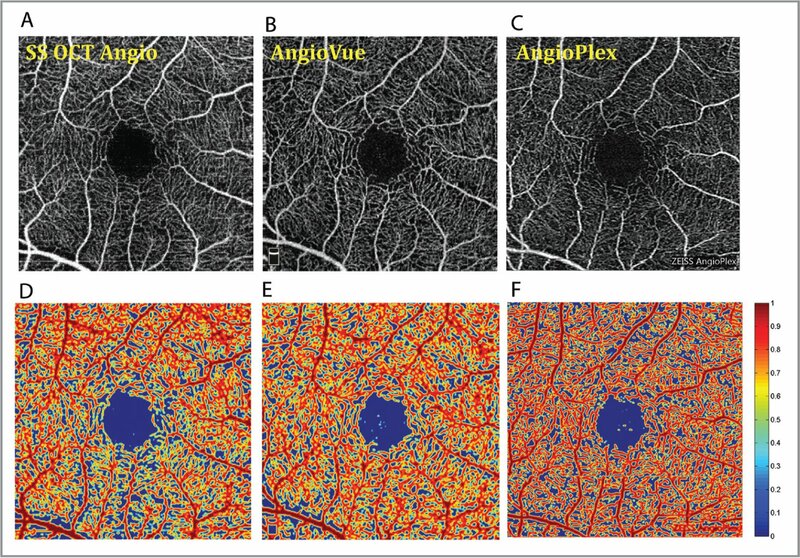 Figures 1A–1C show the OCTA images of the superficial retinal vascular plexus obtained using SS-OCT, SD-OCTA, and Angioplex, respectively. Figures 1D–1F show the corresponding contour maps generated using LFD method. Figures 2A–2B show the original and Frangi-filtered OCTA images obtained from the Triton device. Figures 2C and 2D show the corresponding contour maps. Figures 3A and 3B show the original and Frangi-filtered OCTA images obtained from the AngioVue device. Figures 3C and 3D show the corresponding contour maps. Figures 4A and 4B show the original and Frangi-filtered OCTA images obtained from the Angioplex device. Figures 4C and 4D show the corresponding contour maps. All contour maps use the same color scale as shown in Figure 1. Optical coherence tomography angiography (OCTA) image of the superficial plexus generated using swept-source OCT (A), spectral-domain OCTA (B), and Angioplex (C). Corresponding contour maps (D, E, F) generated using the local fractal dimension method. Swept-source optical coherence tomography image of the superficial plexus before (A) and after (B) the application of Frangi filter, respectively. Corresponding contour maps (C, D). Spectral-domain optical coherence tomography angiography image of the superficial plexus before (A) and after (B) the application of Frangi filter, respectively. Corresponding contour maps (C, D). Angioplex optical coherence tomography image of the superficial plexus before (A) and after (B) the application of Frangi filter, respectively. Corresponding contour maps (C, D). The vascular parameters showed good to excellent repeatability in all the three devices as mean ICC varied from approximately 0.8 to approximately 0.99 (Table 1). Using the nonfiltered OCTA images, the FAZ area was similar (P = .27) between the three devices (Table 1). In the superficial layer, vessel density was similar (P = .14) between the three devices (Table 1). In the deep layer, vessel density was significantly higher (P = .002) in AngioVue OCTA images as compared to those from the Triton and Angioplex devices (Table 1). However, SLV was significantly higher (P < .001), and SSV was significantly lower (P < .001) in Angioplex OCTA scans as compared to the Triton and AngioVue in both the plexuses. 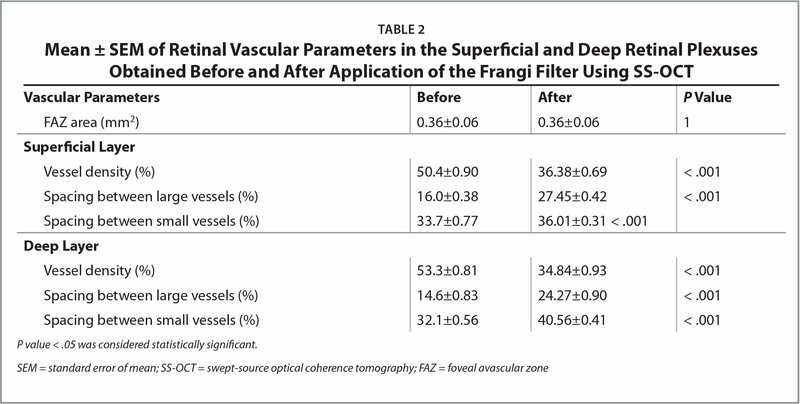 After vessel enhancement with the Frangi filter, vessel parameters were significantly altered (Tables 2, 3, and 4). Vessel density was significantly higher in nonfiltered OCTA images as compared to Frangi-filtered OCTA images (Tables 2, 3, and 4). Further, nonfiltered OCTA images had significantly lower SLV and SSV as compared to Frangi-filtered OCTA images (Tables 2, 3, and 4). Table 5 shows the mean change in parameters from before to after application of the Frangi filter to the images. In the superficial layer, change in vessel density was similar between Triton and AngioPlex images (P > .05), but was significantly lower than the same of AngioVue images (P < .001). Change in SLV and SSV was significantly different between all the devices (P < .001). In the deep layer, vessel density and SLV were significantly different between all the devices (P < .001). The change in SSV was similar between AngioVue and Angioplex images (P > .05), but was significantly greater than that seen on Triton images (P < .001). Thus, there was considerable dissimilarity between the vascular features of the same eye, when imaged with different devices. The study aimed to analyze and compare the retinal vascular parameters in OCTA images generated from three different devices. The devices used different algorithms to generate the OCTA images. 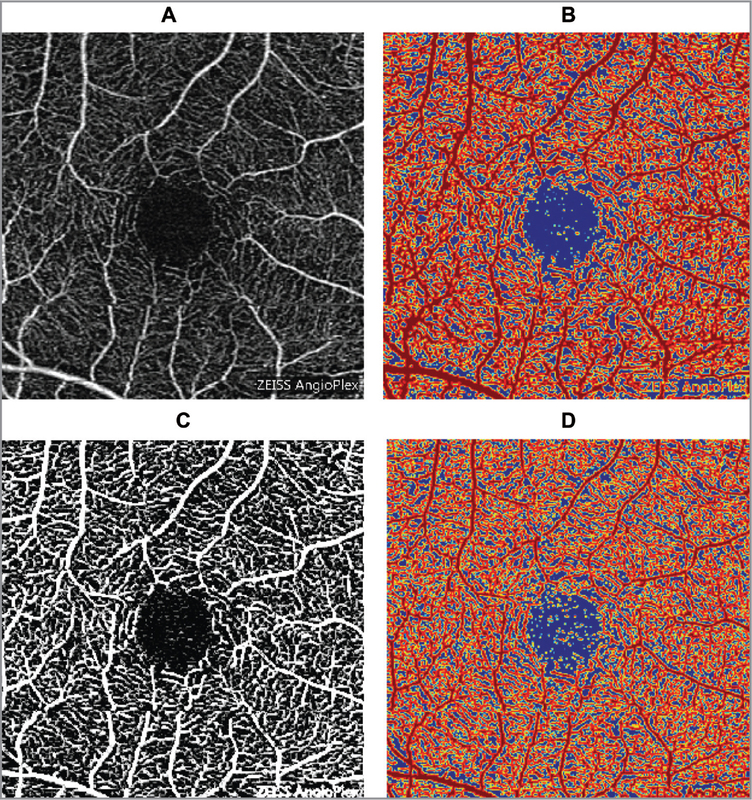 The Triton, AngioVue, and Angioplex used algorithms known as OCTA ratio analysis, split-spectrum amplitude decorrelation algorithm, and optical micro-angiography, respectively, to generate the OCTA images.12 This is the first study where a vessel enhancement filter (the Frangi filter) was applied to the OCTA images11 and combined with the established LFD method2,5,9,10 for quantification of vascular parameters. Several studies have evaluated OCTA images generated from Triton,4,13,14 AngioVue,18–21 and Angioplex.18,19 Recent studies on eyes with glaucoma using the Triton could differentiate pre-perimetric eyes with glaucoma and normal eyes from primary open angle glaucoma.13 The Triton was very useful in the detection of choroidal neovascularization and diabetic retinopathy. Qualitative and quantitative studies on OCTA images using the AngioVue OCTA device were able to detect features of diabetic retinopathy, glaucoma, and glaucoma progression, as well.2,5,13,18,20 Other studies showed the utility of AngioVue OCTA in detecting changes in diseases (eg, artery and vein occlusion, choroidal neovascularization.15–17) A recent study on healthy subjects using the Zeiss Angioplex measured the FAZ area in the OCTA images and showed good repeatability and reproducibility in healthy subjects.19 The Angioplex was able to detect choroidal neovascularization features and provided useful information at follow up post treatment, as well.21 OCTA allowed better discrimination of central subfield and macular microvasculature as compared to FFA.22 Thus, there is comprehensive evidence of the clinical utility of OCTA, irrespective of the device used for clinical evaluation. However, quantitative studies on comparison on different OCTA devices are still lacking. A qualitative comparative study of AngioVue and Angioplex OCTA devices showed that the Angioplex device had a shorter execution time and fewer motion artifacts as compared to AngioVue.23 A study evaluated choriocapillaries perfusion in healthy subjects using the AngioVue and Angioplex OCTA devices and reported low intradevice variability along with interdevice correlation.24 Another study reported similar vessel density in healthy eyes between the Triton and SD-OCT RS-3000 (Nidek, Gamagori, Japan).25 Similar results were also observed in this study before vessel enhancement (Table 1). A recent study performed qualitative and quantitative comparison of four OCTA devices — namely, the Triton, AngioVue, Angioplex, and Spectralis OCT2 (Heidelberg Engineering, Heidelberg, Germany).26 The results showed no significant difference in vessel density between the four devices, which agreed with the outcomes of this study (Table 1).26 However in the deep layer, AngioVue OCTA images had the highest vessel density compared to the other two devices (Table 1). Further SLV and SSV were significantly different between the three devices in both superficial and deep plexuses (Table 1). This could be attributed to differences between the OCTA algorithms, transverse resolution of the scanner and image resolution.26 Table 5 shows clearly the effect of the Frangi filter on the parameters derived from the images. This could be due to difference in the number of B-scans acquired and algorithm used to reconstruct the OCTA images. It is intuitive to conclude that greater the number of B-scans, the greater will be the detail captured in the OCTA image. However, this would also increase the image acquisition and processing time. In general, the Triton and AngioVue devices had similar magnitudes of the vascular parameters since both used nearly the same number of B-scans to reconstruct the OCTA image (Tables 1–4). In this study, the Frangi filter was used to enhance the vessels in the OCTA images.11 This would theoretically result in an image similar to FFA measurement, since noise and some of the smaller vessels may be suppressed.11 The Frangi filter was used in analyses of images of the retina in another study.27 The results of the study showed that vessel density was significantly lower in Frangi-filtered OCTA images (Tables 2, 3, and 4). Additionally, the spacing between large vessels and spacing between small vessels were significantly higher in Frangi-filtered OCTA images as compared to non-filtered OCTA images. This suggests the need for vessel enhancement in OCTA images to make them comparable to FFA vascular parameters. After or during treatment, this could enable extrapolation of OCTA results to possible image results, if FFA were to be performed. Since FFA cannot be performed at each visit of the patient, vessel enhancement would be the only available alternative. It may help in better detection of abnormal areas like macular ischemia or edema in diseased eyes. Further studies on diseased eyes are needed to understand the role of vessel enhancement in detection of abnormal areas in OCTA images. However, there are also practical challenges with disease eyes since the imaging time would increase with multiple devices and patients often do not have good visual acuity. These could lead to significant motion artifacts. In this study, motion artifacts were very limited since all eyes were normal to begin with. Future studies also need to assess the effect of projection artifacts on analyses of the deep layer. The LFD is a useful diagnostic tool in quantifying vascular parameters in OCTA images.2,5,9,10 Recent studies on normal eyes, along with those with diabetic retinopathy or glaucoma, have shown its utility in analyzing vascular parameters in both healthy and diseased eyes (eg, diabetic retinopathy, glaucoma, sickle cell retinopathy.2,5,9,10) The method is device independent. In this study, OCTA images with significant motion artifacts28 were excluded. The three devices implemented their own proprietary projection artifact removal methods. Further, the location of the boundaries for the segmentation of the superficial and deep retinal vascular plexus was the same as the recent study on comparison of four OCTA devices.26 In summary, OCTA images generated from three different devices were analyzed with the LFD method before and after vessel enhancement. The vessel parameters showed good reproducibility among the three devices. Angioplex OCTA images had significantly different SLV and SSV compared to the other two devices and also had the lowest image resolution of 204 × 204 pixels (Table 1). Therefore, image resolution is a critical parameter, when comparing the performance of different OCTA devices. Frangi AF, Niessen WJ, Vincken KL, Viergever MA. Multiscale vessel enhancement filtering. In: Wells WM, Colchester A, Delp S, eds. Medical Image Computing and Computer-Assisted Intervention — MICCAI'98: First International Conference Cambridge, USA, October 1998 Proceedings. Germany: Springer-Verlag Berlin Heidelberg; 1998:130–137. Srivastava R, Wong DW, Lixin D, Jiang L, Tien Yin W. Red lesion detection in retinal fundus images using Frangi-based filters. Conf Proc IEEE Eng Med Biol Soc. 2015;2015:5663–5666. From the Imaging Department, Biomechanics and Mathematical Modeling Solutions Lab, Narayana Nethralaya Foundation, Bangalore, India (NA, AK, ASR); and the Retina Department, Narayana Nethralaya, Bangalore, India (TBM). Address correspondence to Abhijit Sinha Roy, PhD, Narayana Nethralaya Foundation, #258A Hosur Road, Bommansandra, Bangalore-560099, India; email: asroy27@yahoo.com.